A homemade basketball hoop in a Humboldt Park alley. 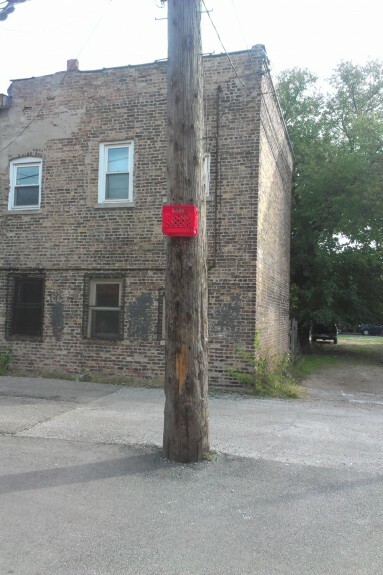 Hoops is a project that I’m undertaking to find and document, homemade basketball hoops in Chicago. I became interested in these structures when I saw a couple of guys playing in an alley near my house in Humboldt Park. Around the same time, a schoolyard basketball court in the neighborhood had been inexplicably removed and I was feeling frustrated about its loss. Space for childhood never feels easy in this city and the ad-hoc hoops felt like an interesting facet of the way youth in the city navigate changing resources and geographies. You can help me with the project by finding and submitting DIY hoops in your neighborhood. I’ve created a mobile web app at http://apps.terrorware.com/hoops/ that you can use from your mobile phone, or you can share photos using the #diyhoop tag on Instagram.